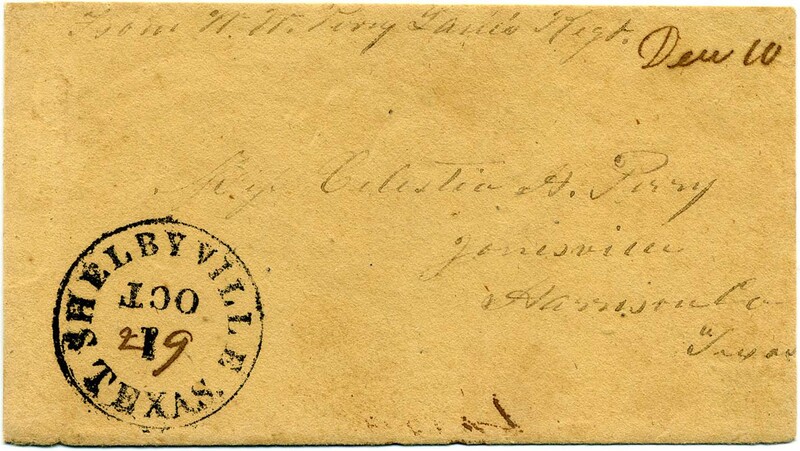 BROWNSVILLE / TEX // 23 / MAY with manuscript “Paid 10” on cover to “James W. Cowetz, San Marcos, Hays County Texas”, reduced at left. $250. WACO [VILLAGE] / Tex. partially struck cds on cover with matching handstamped PAID 5,. addressed to “Col. T. J. 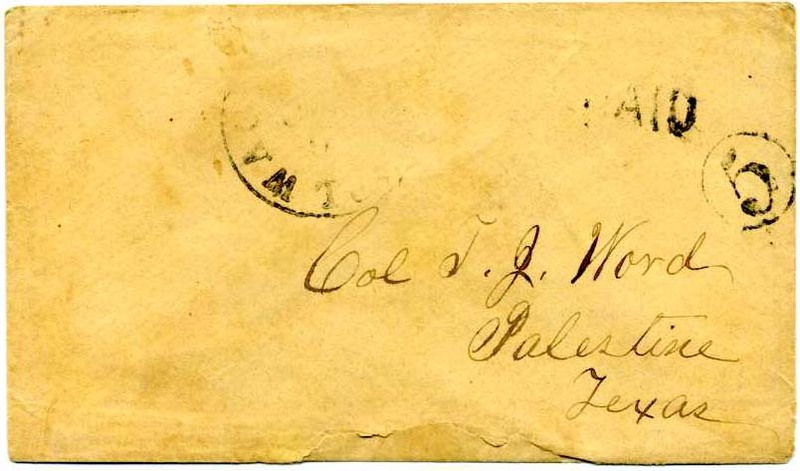 Word, Palestine, Texas”, Word enlisted as a private in Co. G of the 36th Texas Cavalry, ex Kaplan $200. 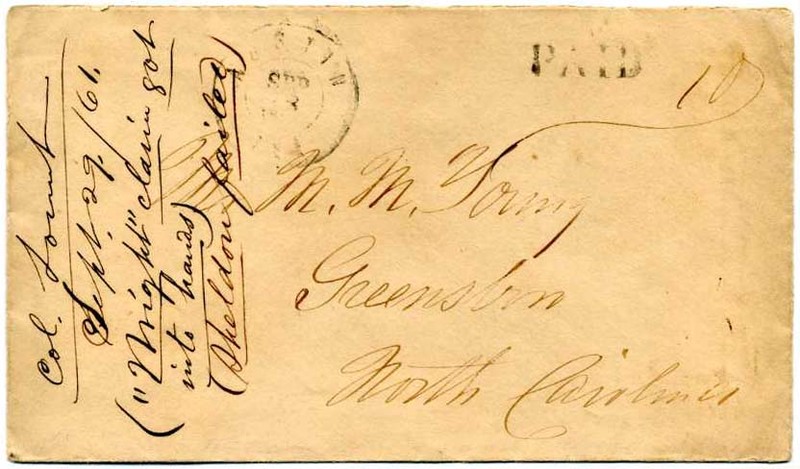 AUSTIN / TEX // SEP / 28 double circle cancel with matching PAID and manuscript 10 on cover to Mr. M. M. Young, Greensboro, North Carolina with docketing of ”Col. Tount, Sept 29/61 ““Might” claim got in hands), (Sheldon failed)”, top back flap missing, A prior owner and an auction house portrayed this as a provisional because the contents docketing is a day after the cancellation date. I do not subscribe to that theory, as there is no control marking. $300. 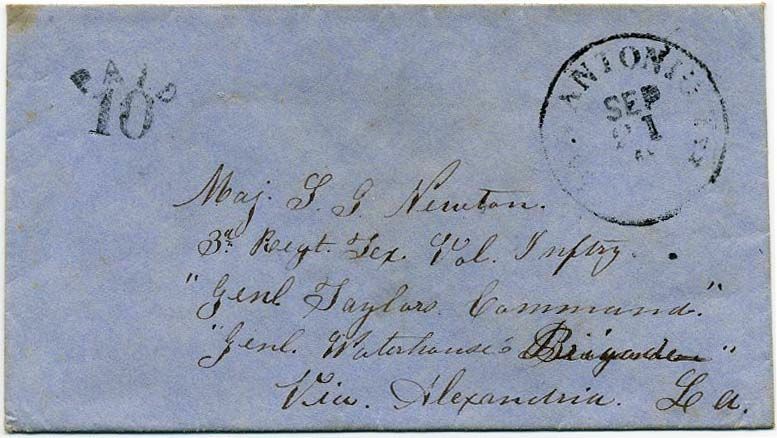 “Belmont, T[e]xas Paid 10”, all in manuscript on folded business letter addressed to W. A. Menger, San Antonio, Texas, The letter is headed Belmont 29th August 1863 and written in German. 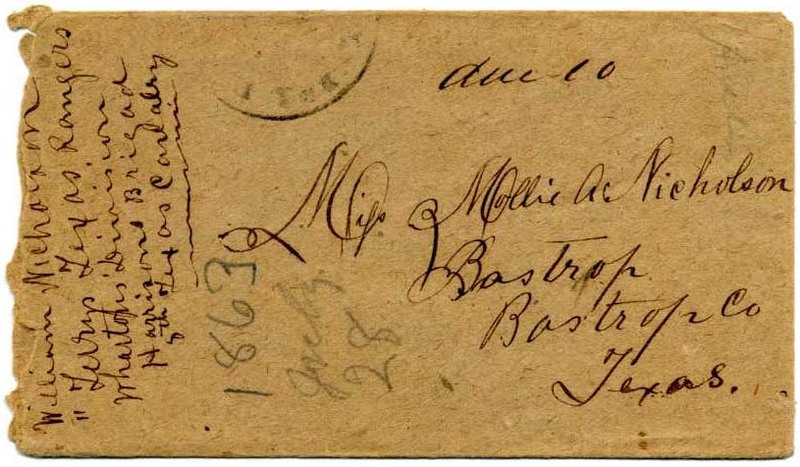 A portion of the top of the letter torn away at top creating a ragged border at the top as well as an archival tape sealed tear down the center. It is docketed as from L. Cahn. A new listing in the CSA Catalog. $350. 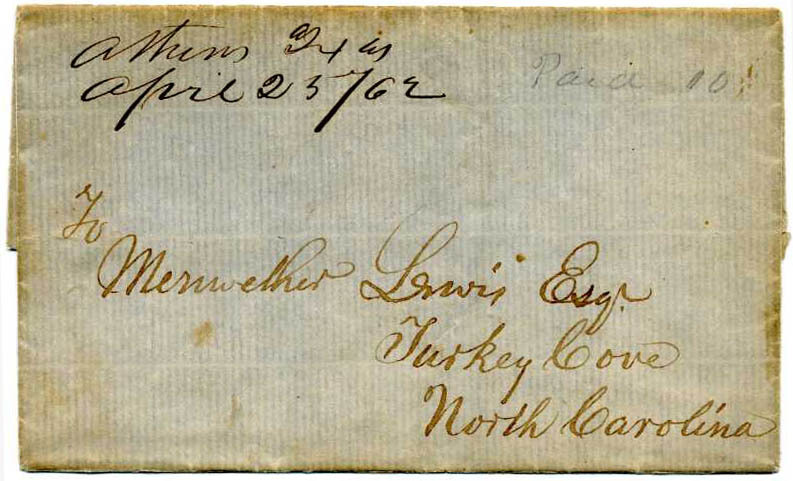 “Athens, Texas, April 25 / 62” manuscript postmark and ms "Paid 10" on outer folded letter sheet addressed to Meriwether Lewis, Turkey Grove, N.C.. No doubt the addressee was related to or named for the Meriwether Lewis of 1804 Lewis & Clark expedition fame (and private secretary to Thomas Jefferson) as the family hailed from that part of the country. $325. TYLER / TEX // DEC / 7 cds on clean cover with matching handstamped PAID and ms “10” addressed to Sam F. Mosely Esq., Jefferson, Texas with name of J. S. L. Earle (likely sender). Moseley was the Confederate State Depositary at Jefferson. $300. PARIS / TEXAS cds with penciled “Paid 10” on clean cover to P.T. 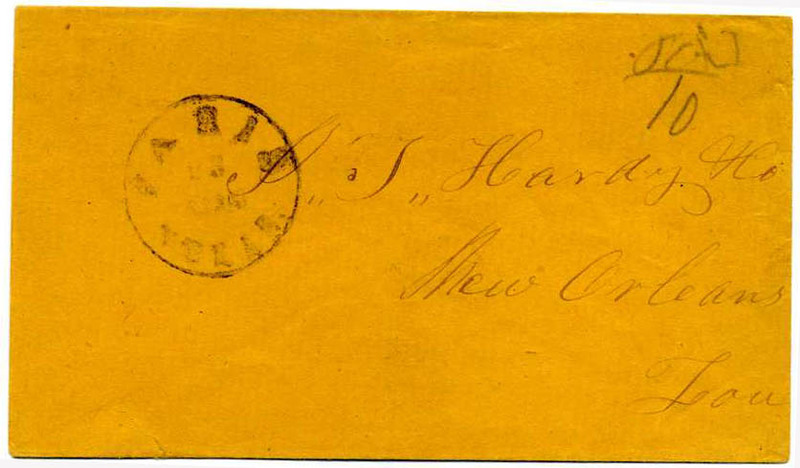 Handy & Co., New Orleans, Lou[isiana]. Very Fine $300. VICTORIA / TEX. 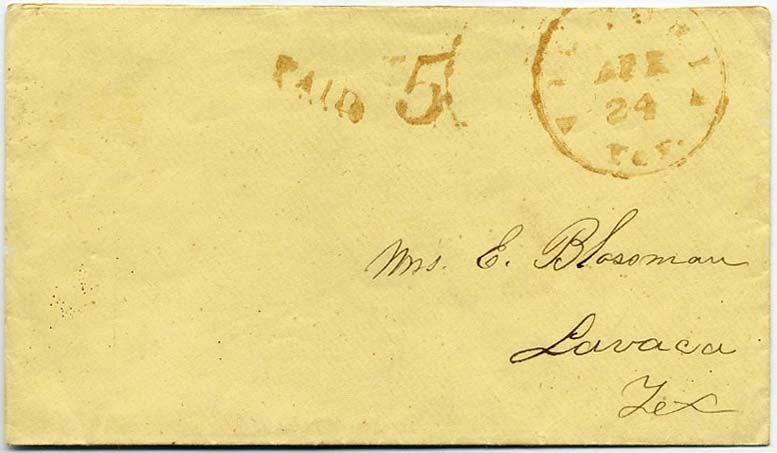 // APR 24 cds with matching PAID 5 rating handstamp (CSA type B) on pristine cover to Mrs. E. Blossman, Lavaca, Tex,Very Fine. This was called “brown” by a prior owner. Brown is listed in the CSA Catalog as a legacy listing as the editors had not seen a “true brown” at the time of publication. In my opinion, this is red that has degraded to brown. This is often seen with black ink as well, which also can degrade to brown depending on the composition of the ink. In both cases, the CSA Catalog Value is $500 and this is the classic strike of the period. “Flawless” strikes are generally bogus. $550. SAN ANTONIO TEX // APR / 24 cds with ms. "O.B." and bold PAID 10 in arc, CSA Catalog type E with CCV $500, on fresh cover to the Enrolling Officer, Wilson County, Sutherland Springs, Texas, cover cleverly refolded at edges, Very Fine, Ex Keeling $400. 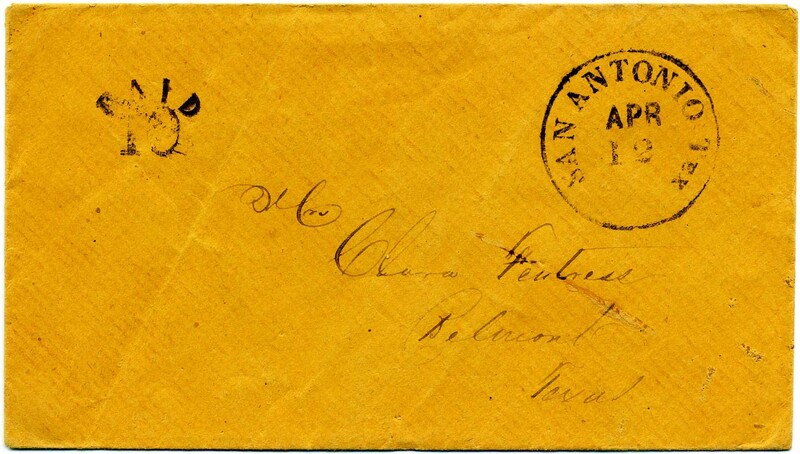 SAN ANTONIO TEX // SEP / 21 cds and bold PAID 10 in arc, CSA Catalog type E with CCV $500, on fresh blue linen-lined “money” envelope addressed to "Maj. S.G. Newton, 3rd Regt. Tex. Vol. Inftry., ‘Genl. 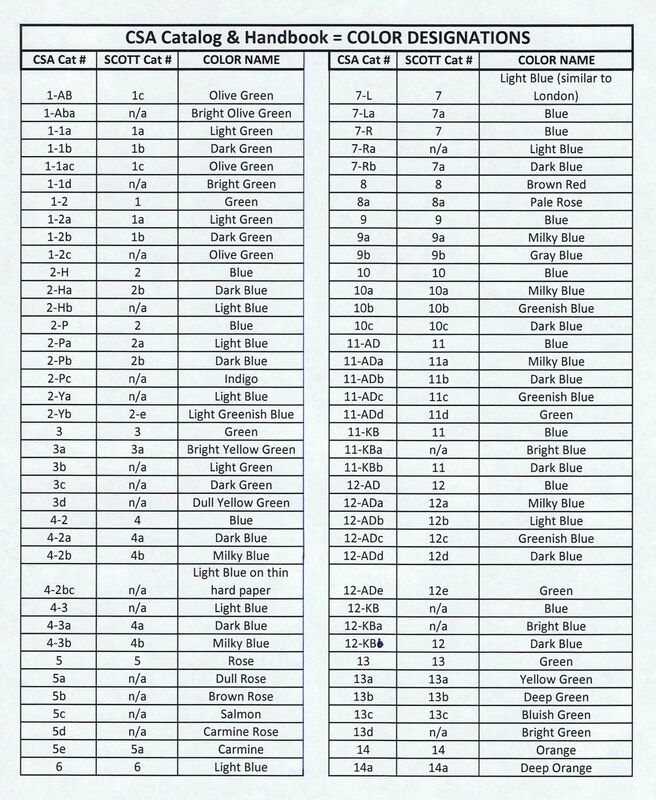 Taylor's Command’, ‘Genl. Waterhouse's Brigade’, via Alexandria La. ", Very Fine; the recipient would later become mayor of San Antonio. $750. Samuel Galitzen Newton (1823-1874) entered Confederate service as a captain of the Bexar County Guards, Co. H. 3rd Texas Infantry. Much more information on linked page. VELASCO / TEX. // DEC / 11  cds with manuscript “Due 10” in pencil on cover to Mrs. J[unia]. M. Osterhout, Bellville, Texas with endorsement of J. P. Osterhout, Adjt 4th Inf, TST (Texas State Troops). $550. 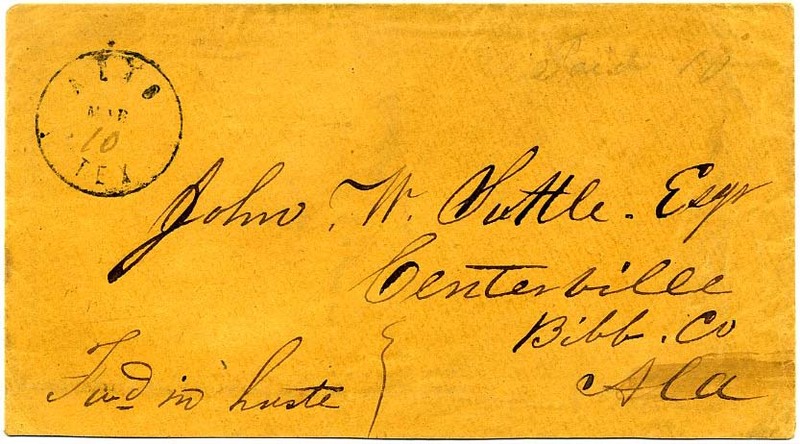 John Patterson Osterhout (1826-1903) was a lawyer, collecting agent, newspaper editor and owner, officer in the Confederate Army, railroad company president, judge, postmaster, rancher and a store owner. Much more information on linked page. ALTO / TEX // MAR / 4 neat cds with pencil “Paid 10” on cover to John W. Suttle, Esqr, Centerville, Bibb Co., Ala and notation “Fwd in haste” (Forward in haste), bottom back flap missing, Scarce, Ex Kohn. $525. Judge John W. and Mary (Goodwin) Suttle were early pioneers of Centreville. Much more information on linked page. ALTO / TEX. // MAY / 23 CDS with day in ms. on cover, manuscript “Due 5” on small cover to Mrs. A. 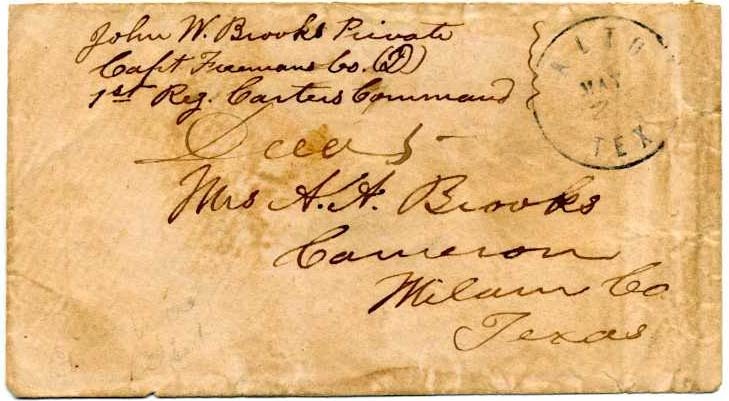 A. Brooks, Cameron Texas, with soldier's endorsement of John W. Brooks Private, Capt Furmans Co (D) 1st Reg Carters Command; couple tiny edge tears, scarce town marking. 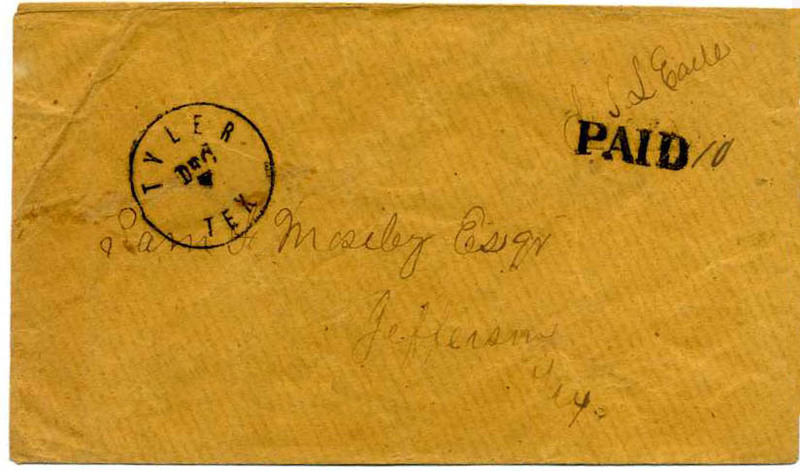 Note on the back that this was the 1932 Dietz listing cover for Alto, Texas – noted in the late Bill Bogg’s handwriting who handled the Dietz collection. $500. 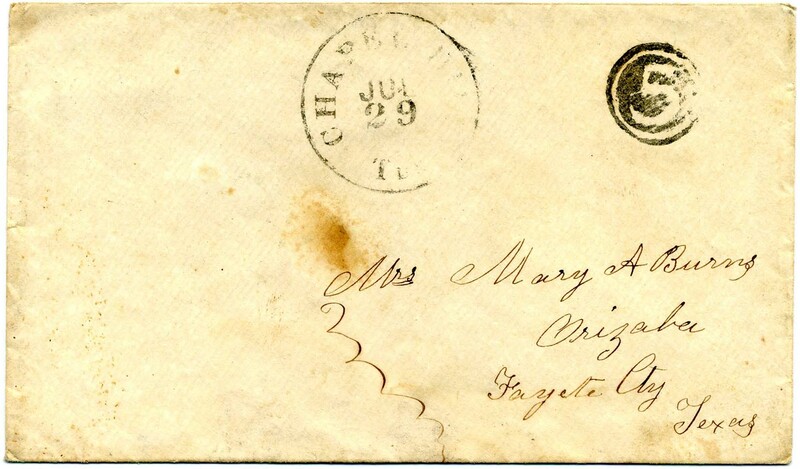 Texas cds partially struck off cover with manuscript “due 10” on cover addressed to his sister. 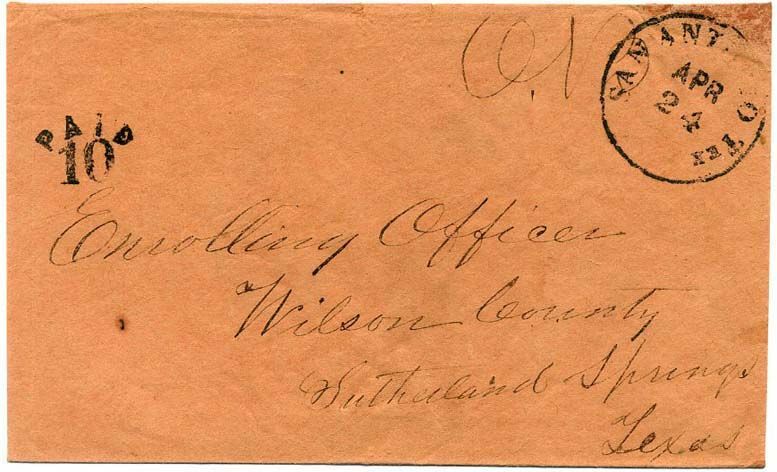 Miss Mollie A. Nicholson, Bastrop, Texas with mandated endorsement of [Private] William Nicholson, Terry’s Texas Rangers, Wharton’s Division, Harrison's Brigade 8th Texas Cavalry. See http://www.terrystexasrangers.org The illustrious Rangers distinguished themselves throughout the war by their skill and willingness to fight. Because of their abilities, and the arms they carried, they were regarded as a "charging regiment," frequently called upon to act as a form of shock troops. 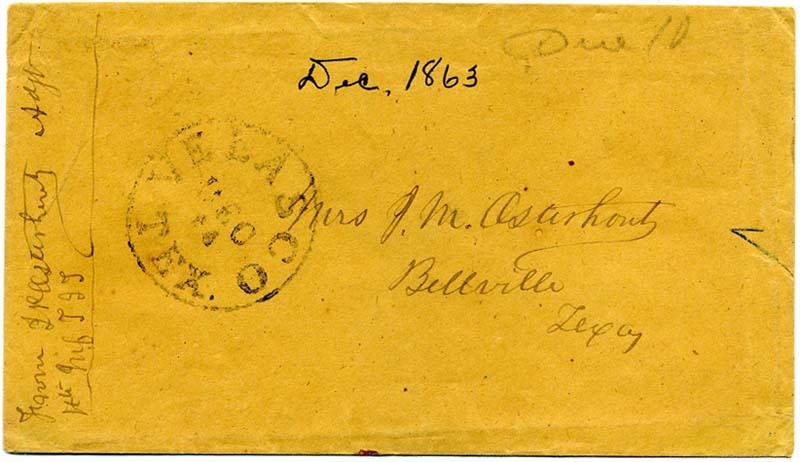 Cover a bit roughly opened at left, pencil docketed July 28, 1863. 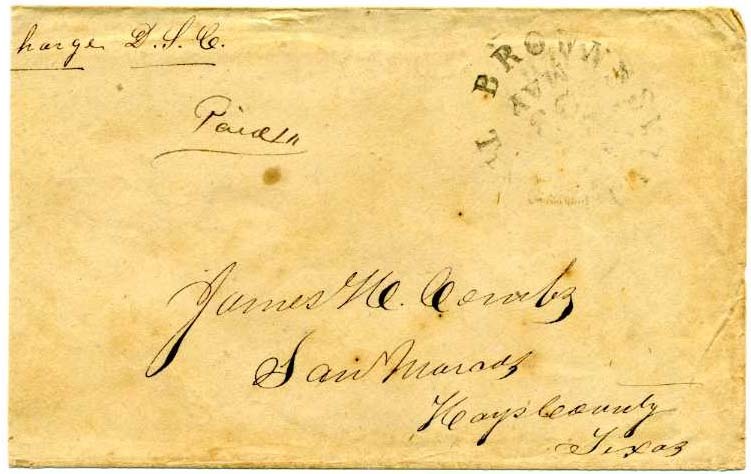 Wonderful piece of postal history. $450. William Nicholson served in the illustrious Terry’s Texas Rangers. Much more information on linked page. FAIRFIELD, TEX dateless circular date stamp on TWICE TURNED TEXAS COVER, homemade from CIRCUS BROADSIDE WITH ILLUSTRATIONS OF PERFORMER AND REVOLVER, (thick paper) originally mailed from a Texas soldier in Mansfield, LA, endorsed “Sergt in Copany (sic) H, Randals Regt Tex Volunteers” to “Mrs. J. T. Stewart, Fairfield P. Office, Texas” and processed through Shreveport with Apr 30  cancel and [due] "10" handstamp. 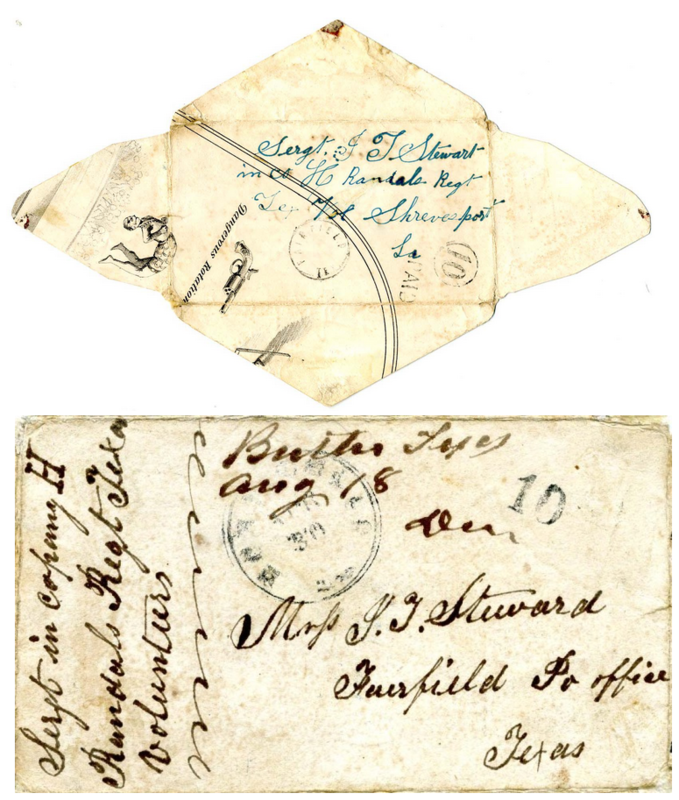 Cover was then turned and mailed back to Sergeant Stewart in Louisiana theater from FAIRFIELD, TX with PAID 10 handstamp (CSA Type B), used once again by same soldier, this time with manuscript cancel of “Butler, Texas” with ms. Aug 18 and matching manuscript “Due” and addressed to his wife in Fairfield, TX, an unusual "twice turned" double Texas cover, Eye-catching! Ex Bleuler and King. $3,000. Sergeant Jeremiah Terry Stewart (sometimes spelled Steward) was in Company H of the 28th Texas Cavalry, Randal’s Brigade, McCullough’s Division, District of Arkansas, Trans-Mississippi Department. Much more information on linked page. CHAPEL HILL / TEX // JUN / 29  cds with scarce neat NEGATIVE ‘5’ (CSA Catalog Type C, CV $500) on cover to Mrs. Mary A. Burns Orizaba, Fayete (sic) Cty, Texas; flap opening tears. $450. 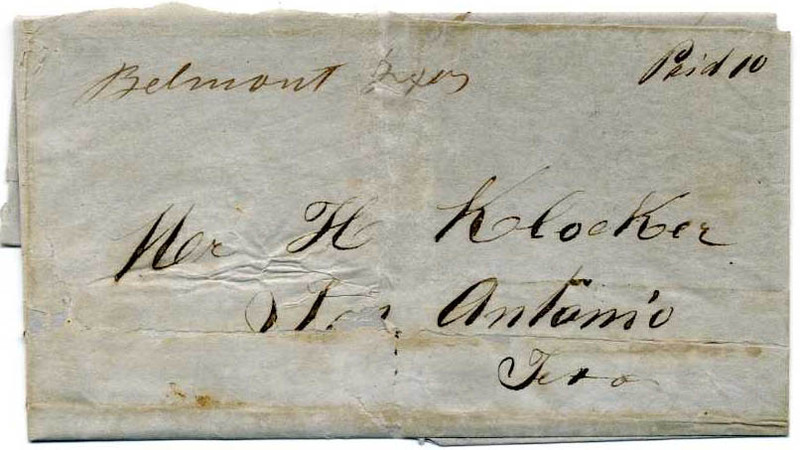 SAN ANTONIO Tex // APR / 12 bold neat cds with matching PAID 10 (CSA Catalog type E, CCV $500) on pristine cover to Mrs. Clara Fentress, Belmont, Texas, from her husband, a Confederate physician. Ex Hill and Camina. $375. Dr. David W. Fentress, a Confederate physician from Texas, exchanged letters with his wife Clara Fentress during the Civil War. He served in the Confederate army in Arkansas (1862-1863), Louisiana (1864), and Texas (1862, 1865). Dr. Fentress served as one of 24 Assistant Surgeons from Texas. More information on linked page. SHELBYVILLE / TEXAS. // OCT 1 cds with inverted month and manuscript “29” date written over “1,” manuscript “Due 10” on neat soldier’s cover to Miss Celestia H. Perry, Jonesville, Harrison County, Texas. Only recorded with manuscript rates. Soldier’s endorsement “From W. W. Perry, Lane’s Regt.” at top, slightly reduced at top and right. $425. William Wiley Perry served in W. P. Lane Rangers. Much more information on linked page.